Recent studies show that food intolerances are almost 5 times more prevalant today than in the 1950s; as many as 1 in 6 Americans is estimated to have a food sensitivity. Exercise can make food intolerances even worse for endurance athletes. Food cravings, GI distress, headaches, brain fog--these common reactions can be more than symptoms of a tough workout. They could be caused by the foods you eat. 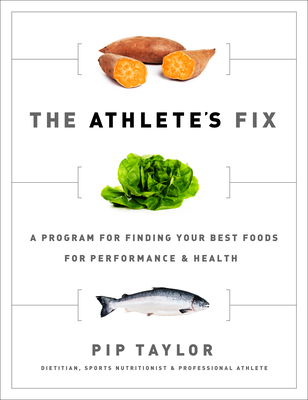 In The Athlete's Fix, registered dietitian Pip Taylor will help you find your problem foods--and the foods that make you feel and perform your best. The Athlete's Fix offers a sensible, 3-step program to identify food intolerances, navigate popular special diets, and develop your own customized clean diet that will support better health and performance. Endurance sports stress the body, often worsening mild food sensitivities and causing symptoms like GI distress, food cravings, and headaches. Many athletes aggressively eliminate foods as a one-size-fits-all solution. These restrictive diets sometimes bring short-term improvements, but they are difficult to maintain and often leave athletes undernourished and underperforming. The Athlete's Fix offers a smarter, fine-tuned approach. Taylor will show how you will benefit most from a diet full of a wide variety of foods. You'll improve your daily diet, cut out common irritants, then add back foods until you feel great enjoying your own personalized clean diet. To help with this transition, The Athlete's Fix offers 50 recipes using easily tolerated foods that support a base functional diet. The Athlete's Fix will help you isolate and identify your food intolerances while enabling you to eat the widest possible variety of healthy foods. Feel better" oeperform better--with The Athlete's Fix. Pip Taylor, APD, is a certified sports nutritionist, accredited dietitian, and professional triathlete. She earned Australian Under 23 Triathlete of the Year awards before beginning her professional career racing on the international triathlon circuit. She has been a member of the Australian Elite Team and has won and placed on the podium at ITU World Cup races, ITU World Team Championships, and Ironman 70.3 (R) events. She has a B.S. in Life Sciences, a M.S. degree in Nutrition and Dietetics, and a post-graduate Diploma of Sports Nutrition from the International Olympic Committee Medical Commission. Taylor has contributed to books Racing Weight and Hardwired for Fitness and to a variety of media including Triathlete, Triathlon Multisport, Ironman.com, 5150.com, Australian Women's Health and Fitness magazine, Pure Fit radio and podcast, and Marie Claire UK. She offers seminars on health and wellness and sports nutrition.